Police have also urged the public to avoid the Street after witnesses describe a car bursting into flames. Melbourne: At least one person was killed and two others wounded in a rush hour stabbing incident in Melbourne's central business district, police said on Friday. 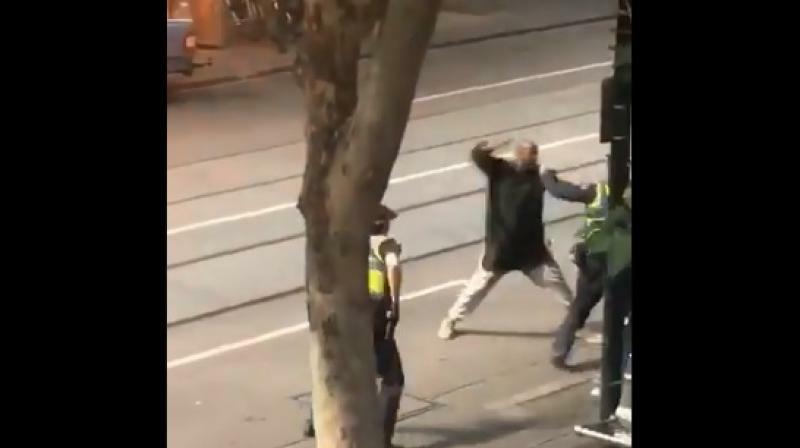 One person was arrested and is in a critical condition after he was a shot by police as he lunged at officers with a knife at the busiest Bourke Street mall in Melbourne. Police initially responded to a report of a car on fire near the corner of Swanston Street about 4:20 pm (local time), Victoria Police said in a statement. A man, believed to be the driver, stabbed three people and was then shot by police. "A man was arrested at the scene and has been taken to hospital under police guard in a critical condition," it said. Police are not looking for anyone further at this early stage. Ambulance Victoria said paramedics had assessed three people at the scene. One person has been taken to hospital with a neck injury in a suspected critical condition, one with a head injury and a third with unknown injuries. The area has been cordoned off, police said.